I was in California last month, and I had a few hours to kill one afternoon when I was in the East Bay area so I swung by the Eastmont Mall in Oakland California. I didn’t do any research beforehand, I just saw it marked on my Rand McNally map so I toodled by. Now, let me step back a bit. Had I done some research beforehand, I might’ve heard some of the horror stories about how this is a pretty dangerous place, and a pretty tough part of Oakland. I could tell it wasn’t exactly the best part of town when I visited but it seemed OK to me–even kind of cheery–and I wasn’t even remotely scared to be prowling around. Of course, then I come home to write this article about the place and I find heartwarming stuff like a YouTube video of a drive-by shooting while it is occurring in 2006. 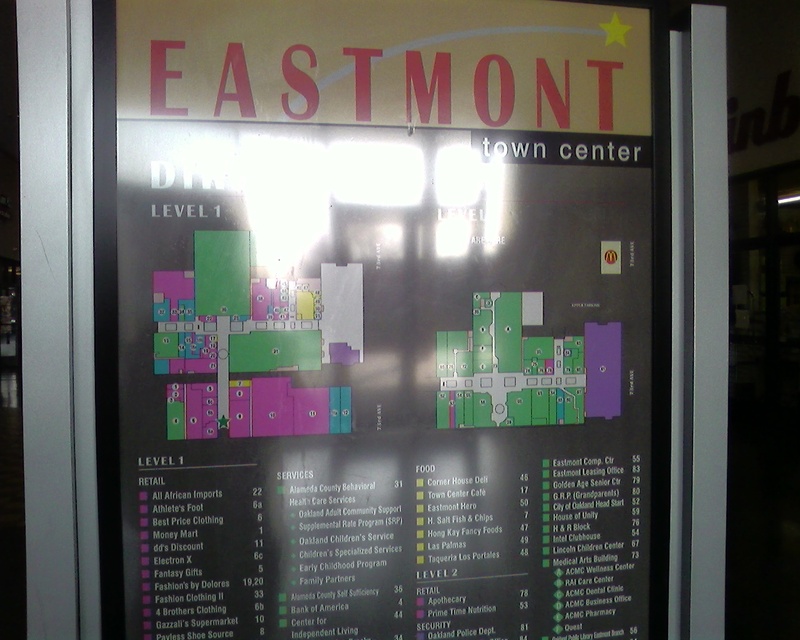 The Eastmont Mall–or Eastmont Town Center as it seems to be referred to nowadays–is a pretty strange mall. 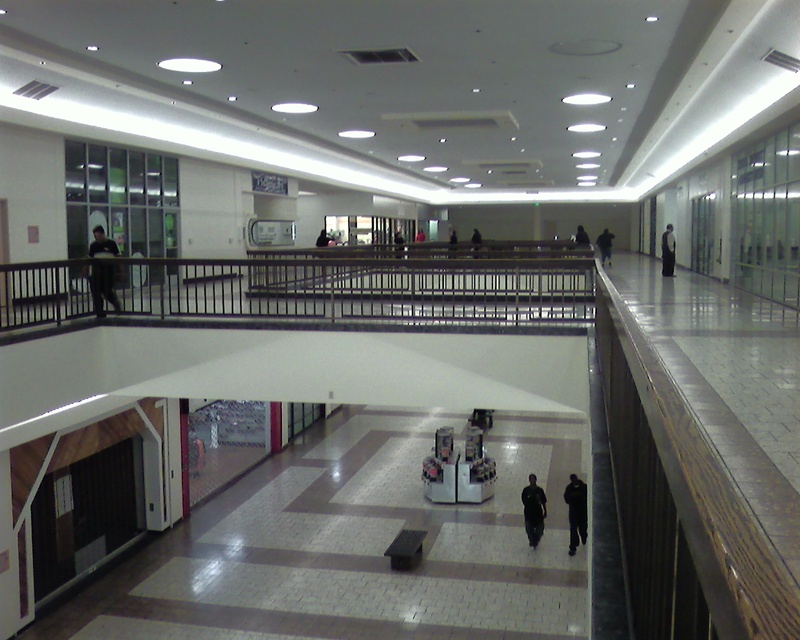 Built in 1970, the large two-level mall served the vast southeast side of the city of Oakland. 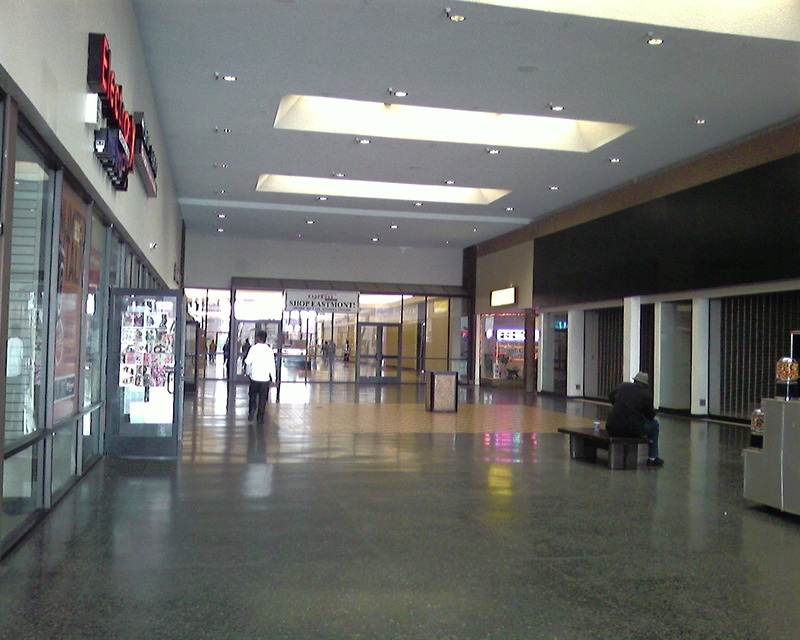 The mall’s floorplan is relatively typical, with a “T” shape and two large anchor stores, but is a bit unusual because a long strip mall flanks the mall’s southwestern edge facing Bancroft St., and one wing of the mall protrudes through the center of the strip mall and exits to that side of the parking lot. 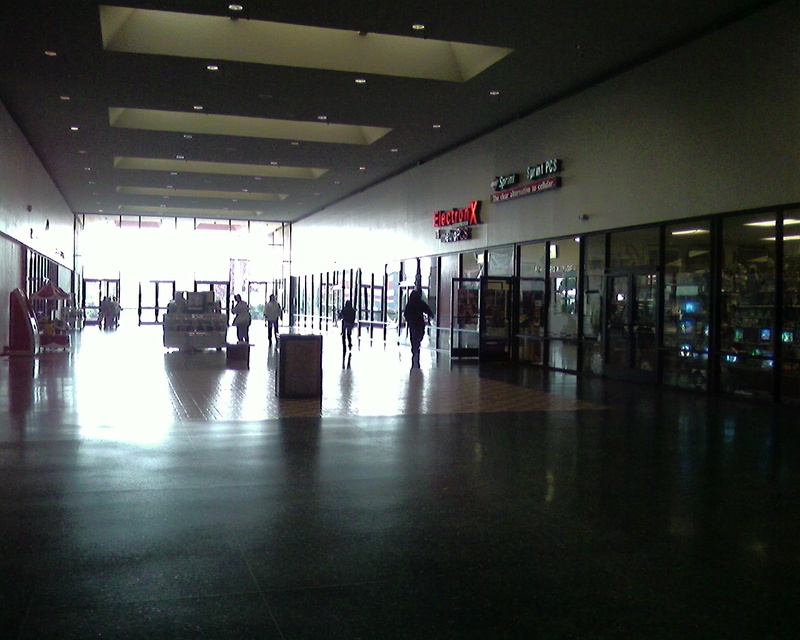 Originally, the mall’s primary anchors were JCPenney and Mervyn’s, and a Safeway Supermarket and Woolworth were amongst the more junior tenants. 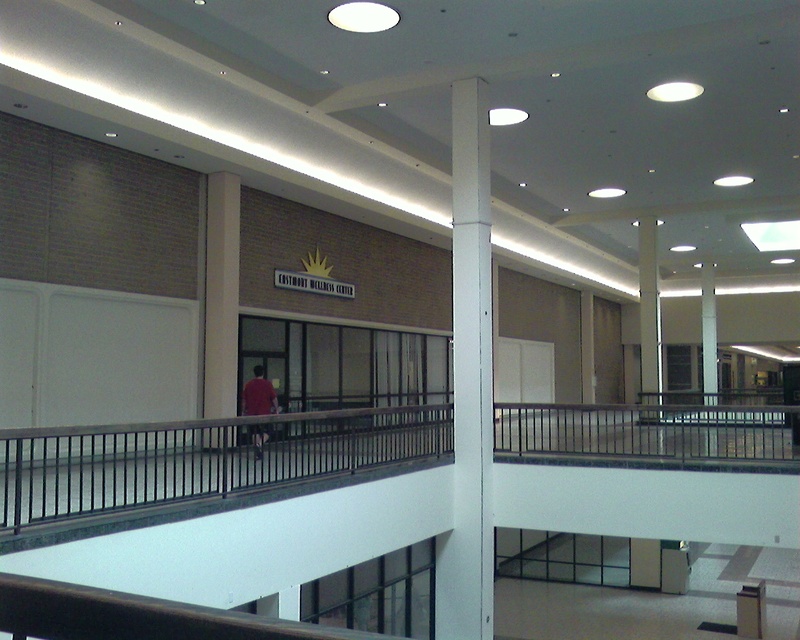 The mall fell into steep decline in the early 1990s when JCPenney and Mervyn’s left, and the reputation of the declining neighborhood kept most suburban shoppers away. Over the 90s, the mall was gradually converted into county offices, including a health clinic, police station, and other services (somewhat famously, there’s also a Planned Parenthood). The strip mall portion continues to house retailers, and there are a few isolated stores or cafes within the mall itself, but only a few. Because Eastmont Mall hasn’t functioned as a true “mall” for a good 15 years, it’s retained much of its vintage early 1970s decor. 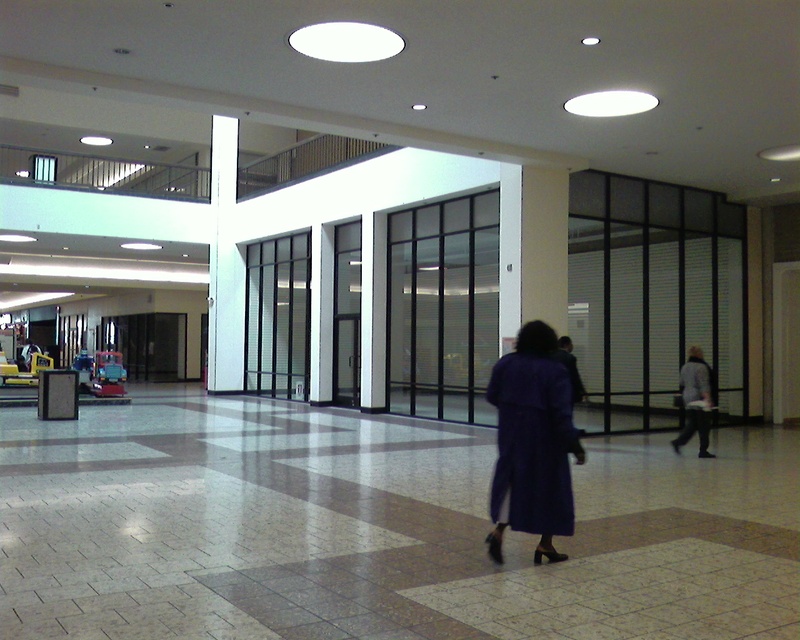 This isn’t to say it’s terribly pretty–in fact, it’s a pretty plain and ugly mall. But it is stuck in a time warp, and for that reason alone it’s kind of interesting. Also, it’s available as a location to film your next movie. What’s not to love? While this mall has retained that weird sinister beauty of 70’s architecture, it is exactly what you said it is…a very plain mall. 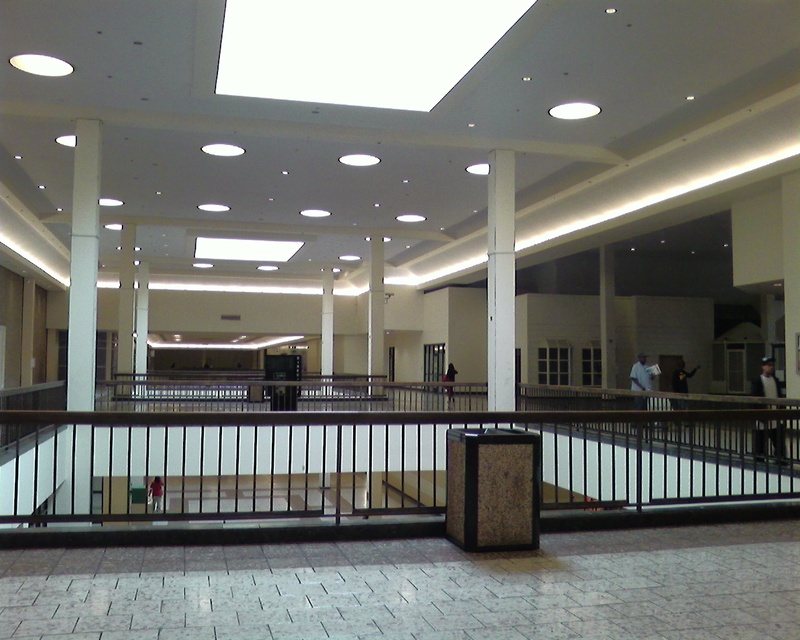 It is very depressing, too, which seemed to be typical of 70’s malls in the daytime where the inadequate and poorly-placed skylights only made it worse because they created an imbalance of light that cast dark shadows on everything within. The fact that nearly every mall was built just like this in the 70’s followed by the slightly upgraded 80’s and 90’s mall with less fountains, sculptures and trees are why only the most storied and successful malls stay in business. Malls are a solid monument to the radical, brutal and often cheap looking architecture in modernism, and this is not something that sets well with people who remember when this was the norm. Everybody wants something more attractive and different, but nobody is willing to build a mall that is attractive and different, because they found it cheaper and easier to build a lifestyle center. I think for malls as a whole to ever truly come back in style will require a wholesale reinvention of the concept with smaller more community-based malls: many open-air and refocused on architecture over maximum sales per square feet. Also, these malls would feature maybe one department store, lots of junior box anchors, and big box stores with both inside and outside entrances. 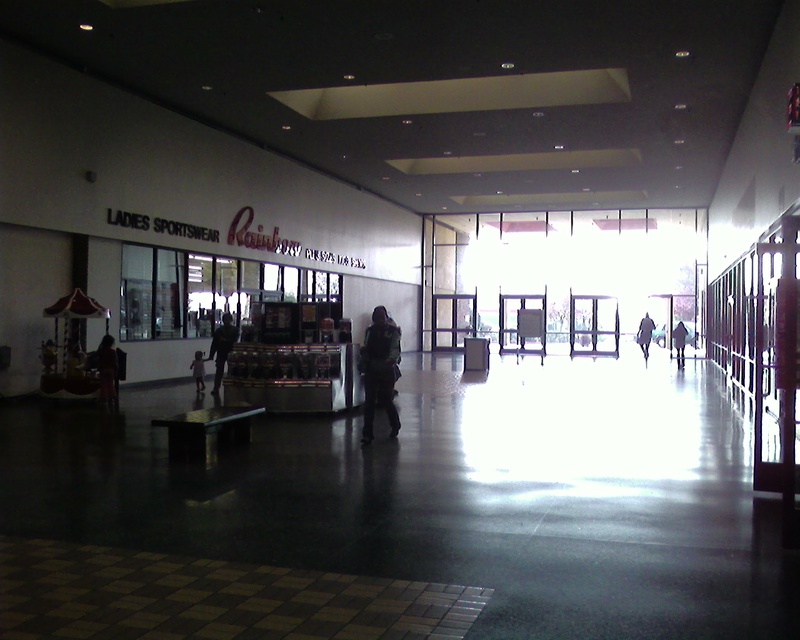 In fact, I think it is the lack of outside entrances precisely is what went wrong with malls since the 1960’s. The outside entrances in the newer malls would effectively merge these short-sighted lifestyle concepts with traditional malls. Looking at the mall directory…this mall has an apothecary? 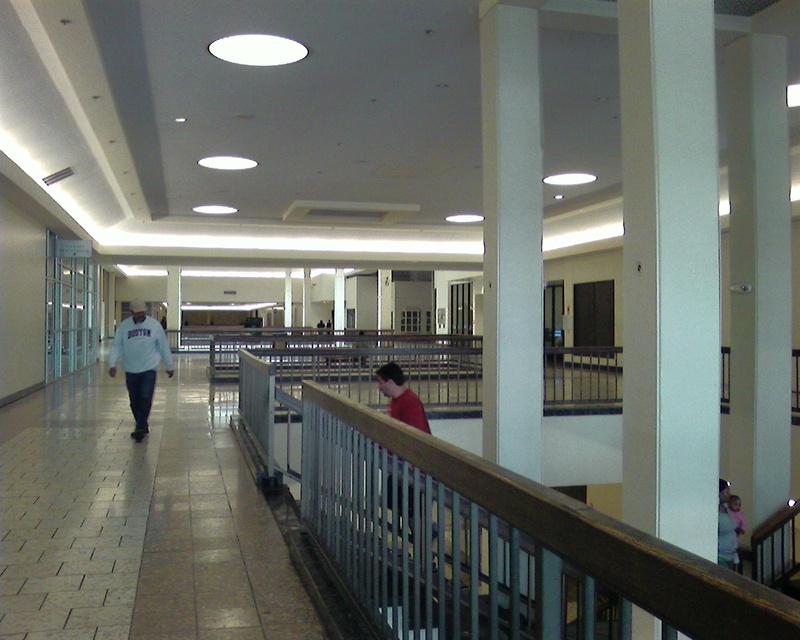 I thought it was a 1970’s mall…not a 1670’s mall. Who uses that term anymore? A great find. And it has the particularly cheap look of a Grade B mall from that era–you can just imagine the buckling drywall where it was poorly installed. The trouble with violent crime is that it doesn’t happen everyday, so even the most notorious places manage quite well on a daily basis; no wonder it seemed so benign. Re: upthread. It’s doubtful that small community malls will ever come back. If they fail, they are expensive to reconfigure, given the footprint. Even before this was evident, they died out andyway–probably because of rising energy costs as the 70s wore on and the realization of how valuable it was to have “at door” parking for a lot of the service businesses and local stores that tended to fill smaller malls.My own guess is that mall developers saw how difficult it was to do anything with dead malls beyond demolision and saw how strips with decent demographics had survived; then, presto “lifestyle centers” were born: strips with a little more imagination (sometimes) than a 1950s “plaza”. Mall’s ghetto but surprisingly clean, well-kept, albeit largely absent. Love the 70s timewarpage. I just watched the video of that shooting — how horrifying. You KNOW a mall’s got security problems when there’s a police station on site. @XISMZERO, I don’t think the police station was put there so much for the mall as for the neighborhood. I think it was a good location with just the right amount of space. They do NOTHING for the mall. Only time they do anything remotely along the lines of policing is when they drive through at the end of the month, to check tags on employees cars at the, to see if they are current so that they can make their ticket quota. In all honesty, it’s not really a “mall” anymore. 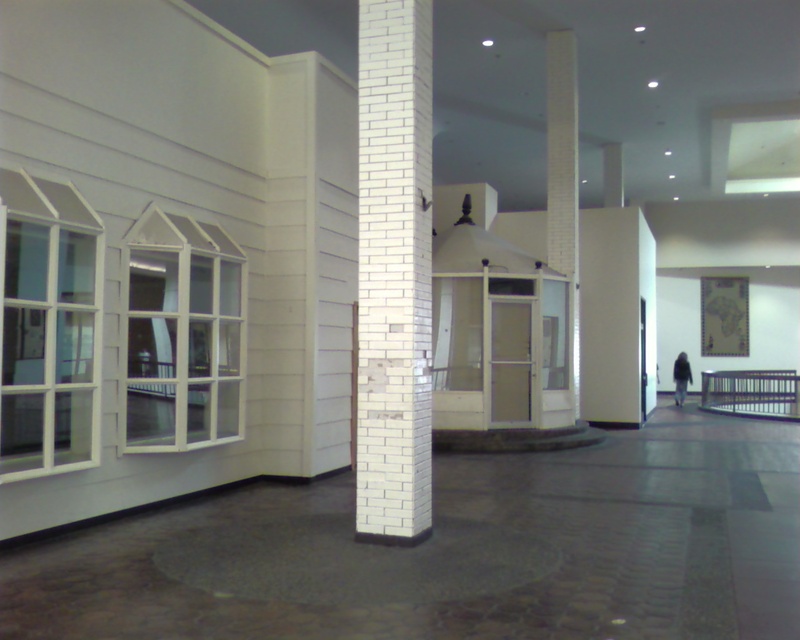 The building was constructed as a mall and physically it’s still a mall, but most of the space is occupied by county offices and social service agencies. The police department is actually a full-sized department that takes up the former Mervyn’s anchor; it’s probably the police department for this part of town, not some substation to serve the mall itself. Wow those shooters had some balls to have a drive-by while there was a cop being interviewed ON THE NEWS. That being said, this mall is plain and ugly. Tear it down..
You did what I haven’t been able to muster up the courage to visit since 1986: Eastmont Mall. I’ve been dying to see what the place looked like since its revitalization. Definitely improved. You’d may never know it, but the place is actually making money. It made news last year. 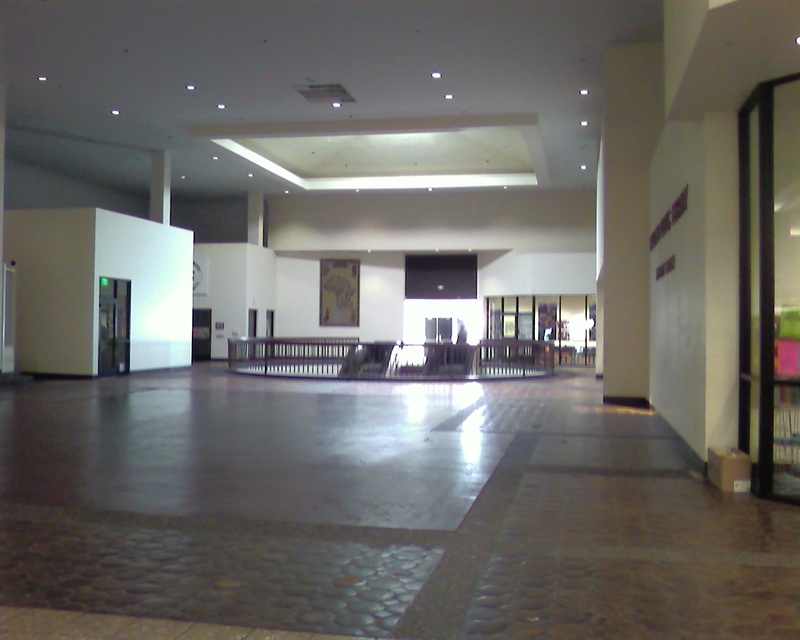 I hadn’t any idea that there wasn’t any (or many) tenants inside the mall. Although, there is talk of putting in a food court. East Oakland is a retail dead zone. Not much of anything there, “there.” Crime in this part of the city is just too horrific for businesses to stay open without some expensive measures. Time and time again, local retailers tell stories of shoplifting erasing their bottom line. Yet, a few brave souls test their resolve by staying open to serve the community. I once had this mall listed on my Website, but I got entirely too many complaints. If I tried to put a positive spin, I got complaints about being misled. If I was negative, I was called a racist. This mall was just too controversial and I decided it wasn’t worth my time. With that said, the community leaders are proud to have a success story in a neighborhood that has so few. This mall may not be pretty or have an Abercrombie & Fitch, but it does offer community conveniences and a host of social services. It’s not the eye sore it once was and people finally have a grocery store to shop. You never know what the future my hold. I’m not a rascist or anything but the people in the mall look really sinister and up to something. Lafayette Square Mall in the previous post or so had majority African-Americans, but they actually looked friendly and busy shopping. There were mothers and baby strollers, people talking, and so on. Not just standing around looking like criminals. This place is UGLYYYYYY!!! Looks like a prison instead of a mall. The East Bay looks like a retail graveyard like north St. Louis Co. or the south suburbs of Chicago. E Cerrito Plaza is gone. I’m afraid to ask about Hilltop Plaza in the pitiful city of Richmond. Actually, El Cerrito Plaza is a bumpin’ joint, what with the BART station, mix of big box stores (Bed Bath Beyond, BarnesNobles), the usual smatter of quick-serve restaurants (Pasta Pomodoro, Rubios, Macaroni Grill) and 2 grocery stores that are constantly busy (Trader Joe’s, Lucky). Some modest extrenal remodelling, and a fresh coat of paint and it’s still around. I still can’t figure out the clock tower roundabout drive piece, tho. Definitely quirky. this is a really good article, these comments are great too. i Googled: “what happened to eastmont mall” and this is what i got. i think it’s really a shame that there is NO shopping center in oakland. downtown oakland may have a Gap, but the shopping there is a joke too. 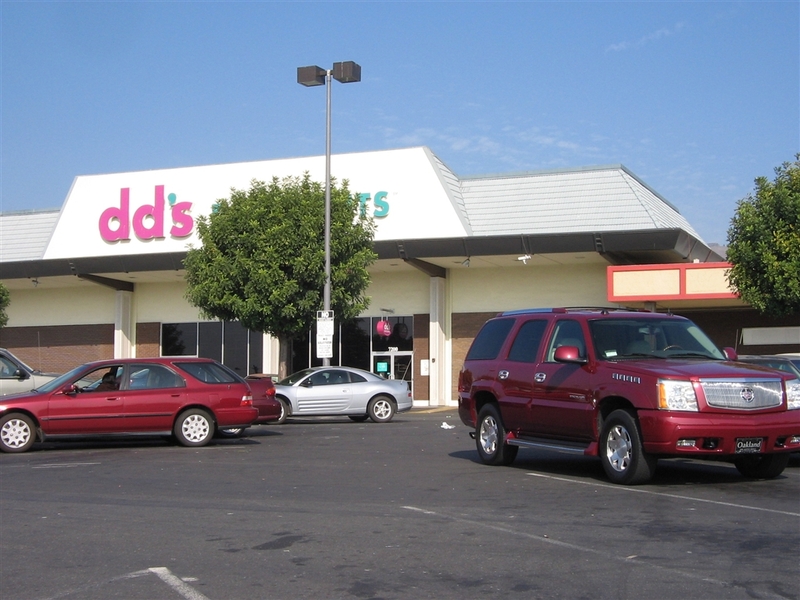 i read a little history on the drug scene during the 70s and 80s, that drove retailers and customers away from eastmont, but it’s still a shame that oakland kids have no mall to go to. it’s pretty amazing though, every neighboring town has a shopping center or a cineplex, but nothing in oakland. The place still looks like the same sewer to me…….. I grew up there not far from the mall………. Stay away if you value your life……..
Love the poster of Africa in one the pics. If that’s not a sign to stay away, nothing is. All I can say is that your lucky you and your photos have come back safely! Oh yeah, the Safeway had a neighboring SuperS Drug Store which later became a PaynSave Drug Store. 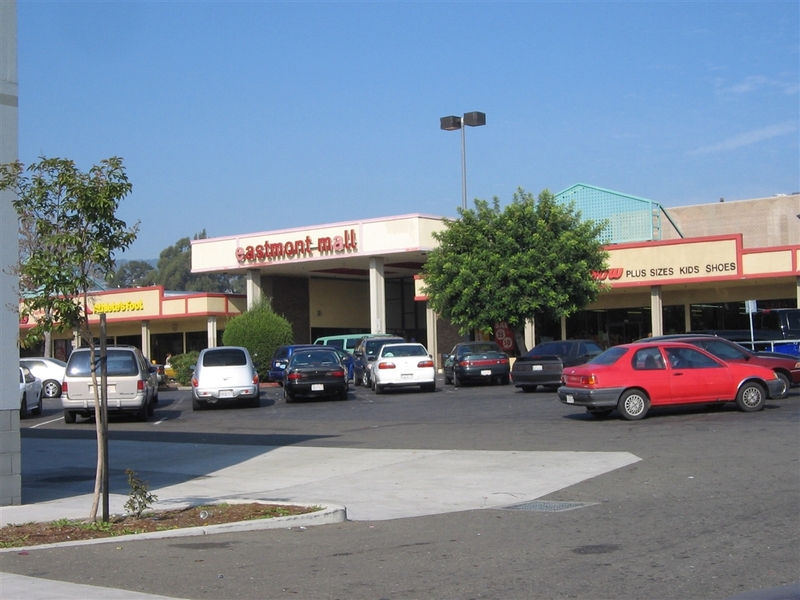 I grew up in [East] Oakland, and as a teenager, I probably spent every weekend at Eastmont Mall. Your photos really brought back memories for me! I moved from Oakland to Sacramento in 1996, and have’nt really been back since then. But I still remember Eastmont when it was full of boutiques, jewelry stores, a toy store, Wauzi Records, a movie theater…it even had a pet store waaaaayyyy back in the 70’s that sold puppies. Wow, am I getting old! Here is a great video of an event held at eastmont. I live in Hayward and people be hatin on southland mall too! Eastmont is not alone! Wow, I am surprised to see this mall on the site. I was in the mall around 1998, not by choice though… I tell this story often, so here goes… I was attending the Gatsby Fair in the Oakland Hills one year, and, keeping true to the era, they would not let me in wearing shorts (I was only 15, and I was with my parents, and grandmother) so my step-father and I ventured off to find a mall for some pants for me to wear. We came upon the Eastmont Mall, and I have to say that even though it retains some of it’s historical aspects, it has undergone improvements, it was much more a time-capsule to the very early 70’s back then…. The murals of mixed-cultured people on some walls, the lack of climate control, and being a first-generation european, there was at that time a huge reverse-racism factor. Housed in a mostly african-american side of East-Oakland, we were the only two white people in the mall, and we were getting looks of misplacement, and a general “not welcome” feeling. 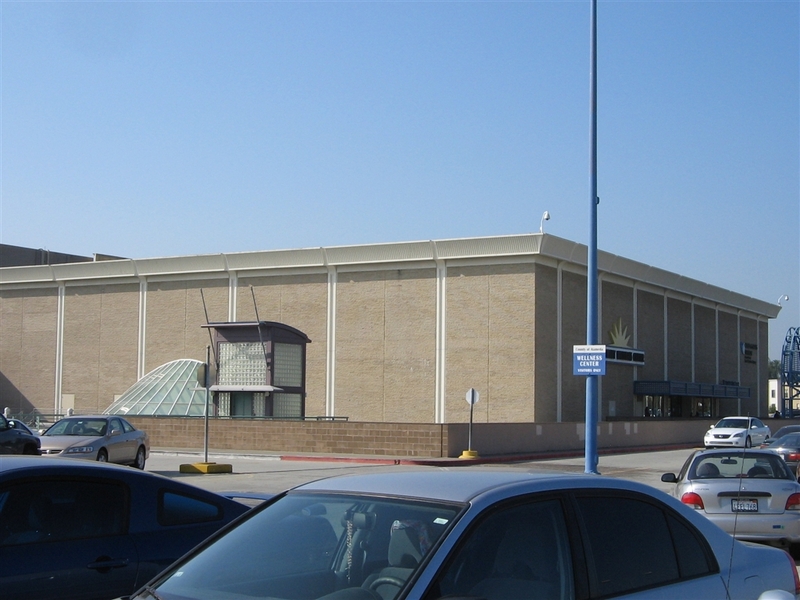 I also noticed though, how great this mall must have once been, the then-closed multi-level parking structure, and the closed anchor stores, Eastmont was by no doubts hurting financially. In fact, when I found what was probably the best pair of pants I have ever owned, we paid the gentleman, and he took and made change from a fanny-pack, very strange, however, it was definately an experience that I will never forget. I not work in a mall, much smaller than Eastmont, but Eastmont is the reason I stumbled upon these great sites developed to honor the great malls of the past, and is also why I have such an interest in the history of the american mall, mostly hoping to find historical pictures from thier great times. As I grew up in the 80’s and 90’s, I wish people took more pictures of those era’s in malls, and I will now make it my mission to do so. 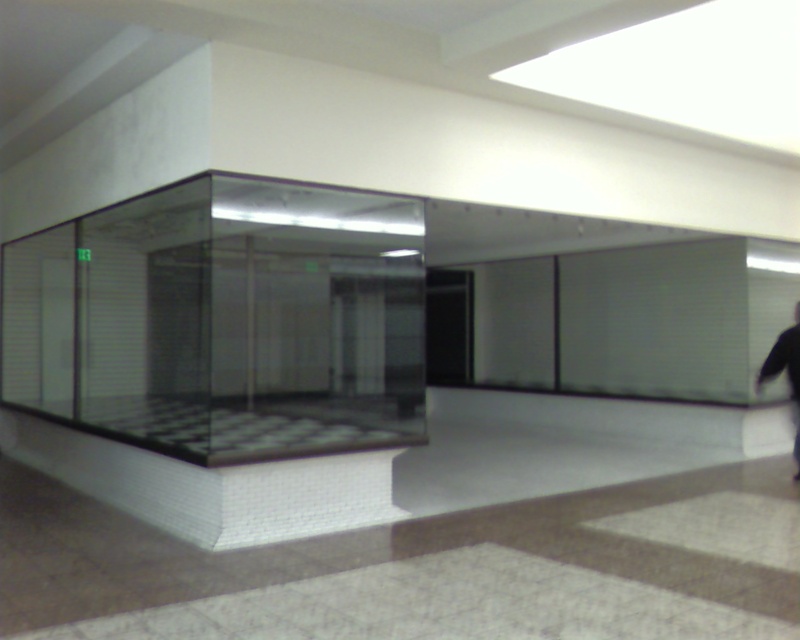 I stumbled on this web site and now I’m hooked on this “dead mall” thing. Anyway, took family members to OAK/KC game yesterday (two bad teams and plenty of good seats!!! ), I’m a MIA D fan, but daughter likes OA. 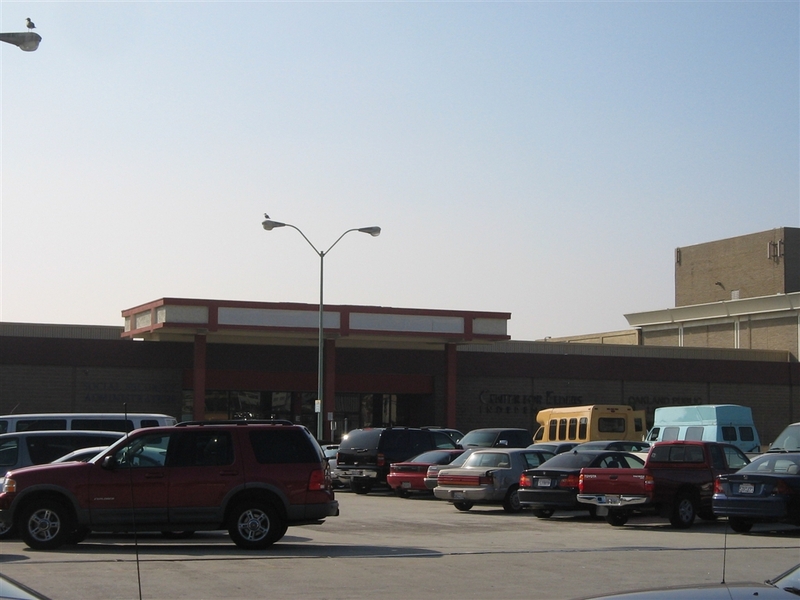 Anyway my wife actually went to the high school next door back in late 80’s, we tried to go inside,,,,it was a Sunday and the mall is closed on Sundays. I’m now officially a “dead mall rat” at the ripe age of 46, and I don’t even like shopping, so going to dead malls is kinda cool, since there’s nothing to shop for. …one more thing the Mrs did say, along with a relative of hers, that the mall for a brief time had the major retailers for was “bustling” with shoppers, albeit breifly. I live in the East Bay and can attest to how dicey the area is. Downtown Oakland is quite safe compared to the area by the coliseum. I only went to the mall once and that was because I was going in drag for Halloween about 11 years ago (today is Halloween, how funny). I saw there was a Payless Shoe Source and was delighted that they had cheap red high heel ladies shoes size 12 and 13 (yep, some of the ladies in Oakland are on the large size with wide feet). My friend and I capped on the mall the whole way home making fun of how few tenants there were and that there is actually a mall there. BTW, there is a term used in Oakland: “Robbed Out”. As in “that store ain’t there no more they got “Robbed Out”. The locals don’t even find that upsetting, which is upsetting.